Have I ever mentioned I have a paper addiction? On one of my last visits to Archivers, I ran across the new Basic Grey Out of Print pattern paper, and somehow it found it's way in my basket! I think this has got to be one of my favorite collections for BG, the prints are so my style! For inspiration I used Card Patterns Sketch 123, along with the theme Something Borrowed or Something Blue at The Kraft Journal. I stamped the Sweet William Flower from Our Daily Bread Designs in Black Archival on the Basic Grey paper, and die cut with Spellbinders Blossom 3, then scrunched and pinched the petals until they formed a blossom to my liking. The sentiment is from ODBD's Faith Set, stamped in Black Archival using a SAMJ, on a scrap of the Out of Print paper. Good thing I had my SAMJ still in place, as there was some crud covering one of the letters (must have been in my ink pad) and I was able to stamp again and fix it. You have a paper addiction? really? LOL! Not that I would know anything about that. 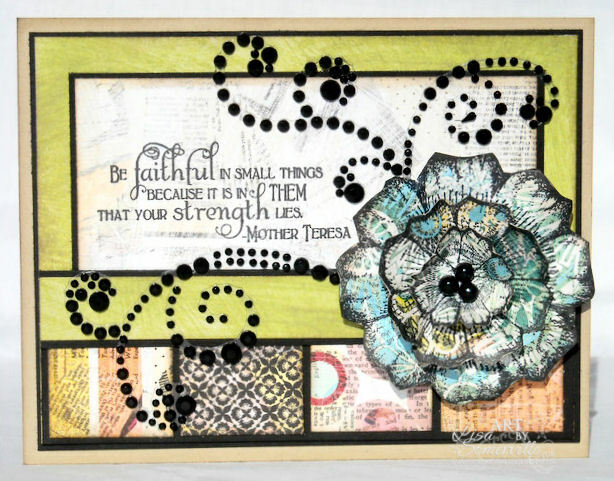 Love how you used the papers and the sketch to frame out your flowers and sentiment! Beautiful! Funny how things just jump into our basket and we have to bring them home! lol Beautiful "Lisa" piece with flowers and pretty colors and bling. beautiful! wonderful composition and colors! I never would have known about your paper addiction, had you not mentioned it! You do amazing work with designer paper! Things jump in my cart, stores and online!!! Beautiful as always! Love the colors, papers and flower! Gorgeous Lisa! Love all the bling you added. So glad you could join us on Card Patterns this week! hehe.. I like how you ran across the new paper! ;-) You make amazing cards Lisa and it's always great to see you latest creation. Keep letting things fall into your basket!! L o v e your gorgeous flower. Bee-utiful card. Paper addiction. You should have seen me at Hobby Lobby yesterday where paper is 50% off this wk. Especially like the embellishments. Wow beautiful card!!!! Love the colors and the design!!!!! Way to go!!!! Yeah, I know Lisa...my paper addiction is so ridiculous that I have asked my friends when I die...please clean out my craft room so my DD does not see how addicted I am...your flower is amazing...I think I have this die and now I want to see if I can make one as beautiful as yours! This is POSITIVELY gorgeous work, Lisa! Ohhhhh, you HAD me at that flower, but your use of the Card Patterns sketch is OUTSTANDING! Thank you, so VERY much, for sharing your talent with Card Patterns this week! Yipeeeee! Beautiful card!!! Amazing colors and patterns, love the combo. And wow for the flower!!! Really beautiful card, Lisa! I'm so loving the patterns on that new BG line. Like how you used a block design of them across the bottom, and love your stamping. That flower is gorgeous. Thanks for joining us again this week at The Kraft Journal. These are my kind of flowers -- I wouldn't be able to kill them! Your vase of paper roses is fabulous! Wow! tHIS CARD IS WONDERFUL! Great combi with all that black, especially the bling swirl! I love that big flourish and your pretty blue flower is a great focal point! Thanks for joining us at The Kraft Journal again this week!